Every girls has a big problem called acne and acne scars. Acne comes for all young teenagers, but obviously they never like the acne and acne scars produced by acne because it will gives the ugly look to our face, before removing the acne faster we want to know ,How acnes are forming? Acnes are the small bumps they shows up the pimples, black heads and white heads, it was caused by over production of sebum gland due to hormonal imbalance during teenage but the good news is if you complete the teenage the acne will automatically went off, but know we don’t want to wait until we complete the teenage, by using this magical face pack we will definitely remove the acne and acne scars very faster and effectively. The ingredients used in this face pack are easily available in your kitchen and this simple and effective face pack contains only natural ingredients only. This face pack will become all-time favorite to you like me. This pack has fully natural contents and it is a homemade and it gives an immediate result within a month of several usages. Don’t miss this easy, simple and effective face pack my dear beauties. 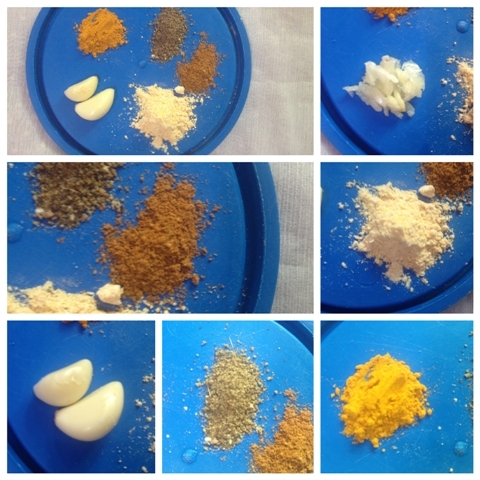 Take the garlics and remove its skin and put in a mixer grinder. Then add sandal wood powder, pepper powder, nutmeg powder and turmeric powder to the mixer jar and grind it well with few drops of water to make a fine paste. First, I use the headband to keep my hair away from my face and then, I apply the garlic face pack paste throughout the whole face and avoid applying near to eyes and lips and leave it for about 5- 10 minutes to completely dry then I splash some water to make it wet then I start massaging throughout my face in an circular motion softly and continuing for about 5 minutes in circular motion and finally I wash it off using Luke warm water (not use hot or very cold water it will make your skin very dry). After using the mask, I dry my face using a cotton towel and I apply some moisturizer cream to my face. I prefer using this mask during evening or night time. I made this face pack twice in a week without leaving a single day because as it’s quite easy to use and really few ingredients are required and it is one of the most effective home remedy. So simply you must try this wonderful face pack to remove the stubborn acne and acne scars. 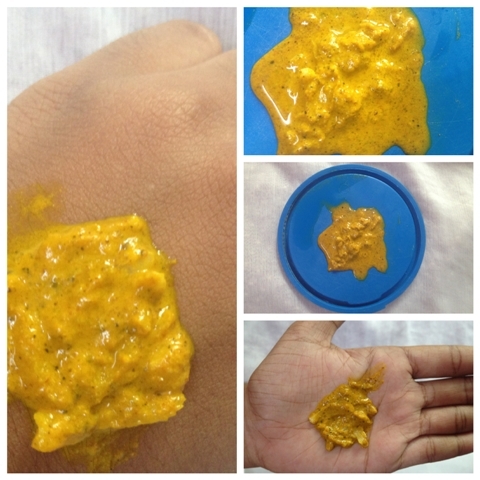 You just use these ingredients to make this effective face pack from today onwards and continue to feel the miracle difference by your own and become a big fan of this homemade face pack like me. Garlic is rich in antioxidant, which helps to regenerate skin and tissues and make our skin looks young.Garlic contains starch and mucilage elements that help to prevent and remove stubborn pimples on the skin, so it is an extremely effective remedy to treat cases of acne and pimples or bumps. Sandal wood powder will lighten the acne scars and pimple marks and removes the acne and pimples from the root itself. Leaves your skin soft and supple and gives good glowing skin. Nutmeg powder has natural astringentproperties that are heavily used by anyone who suffers from hormonal or cystic acne. Nutmeg can also help out with dry skin, and good exfoliator. And it gives good tone to your skin and helps to remove acne scars too. Pepper has antioxidant and antibacterial properties which helps to cure pimples, acne and lightens the skin tone. And it definitely remove the pimples and pimple scars effectively and prevent your skin from acne and pimple problems. Turmeric powder contains more than 300 antioxidant and anti-bacterial properties which are very useful for acne treatments, and it can be used for both oily and dry skin angels. It helps to remove facial wrinkles and reduces the sign of aging and it also used to remove stretch marks in our body. It gives good skin tone and helps to reduce the pigmentation of our skin. It helps to remove skin tanning and also helps to remove facial hairs permanently. It helps to get rid of cracked heel problem by its healing properties. And it helps to remove dead skin cells. Use all the ingredients mentioned above without fail then only you get effective result. Don’t apply this face pack near your eyes and lips. This face pack will produce some irritation due to pepper and garlic paste so try to hold it. Apply this face pack in night and evening time. If you have sensitive skin try to avoid this face pack.